Anthropology > Manners and customs (General) > Customs relative to private life, Including children, marriage, eating and drinking, funeral customs, etc. Antarctica, the last place on Earth, is not famous for its cuisine. Yet it is famous for stories of heroic expeditions in which hunger was the one spice everyone carried. At the dawn of Antarctic cuisine, cooks improvised under inconceivable hardships, castaways ate seal blubber and penguin breasts while fantasizing about illustrious feasts, and men seeking the South Pole stretched their rations to the breaking point. Today, Antarctica’s kitchens still wait for provisions at the far end of the planet’s longest supply chain. Scientific research stations serve up cafeteria fare that often offers more sustenance than style. Jason C. Anthony, a veteran of eight seasons in the U.S. Antarctic Program, offers a rare workaday look at the importance of food in Antarctic history and culture. 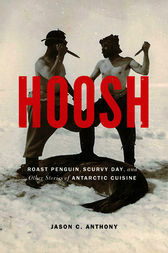 Anthony’s tour of Antarctic cuisine takes us from hoosh (a porridge of meat, fat, and melted snow, often thickened with crushed biscuit) and the scurvy-ridden expeditions of Shackleton and Scott through the twentieth century to his own preplanned three hundred meals (plus snacks) for a two-person camp in the Transantarctic Mountains. The stories in Hoosh are linked by the ingenuity, good humor, and indifference to gruel that make Anthony’s tale as entertaining as it is enlightening. Jason C. Anthony’s essays have appeared in Orion, VQR, Alimentum, the Missouri Review, and in the Best American Travel Writing 2007.